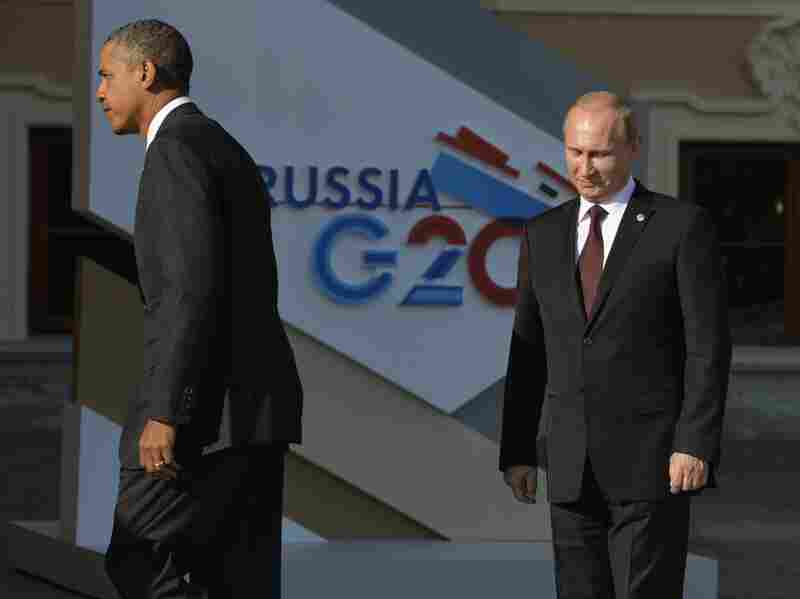 Even Their Seats Are To Be Separated When Putin And Obama Meet : The Two-Way "Awkward" is the word being used to describe the upcoming encounters between the two leaders at the G-20 Summit in St. Petersburg, Russia. Thanks to a shuffling of the seats, news outlets report, the Russian and U.S. leaders won't be sitting near each other during group meetings. 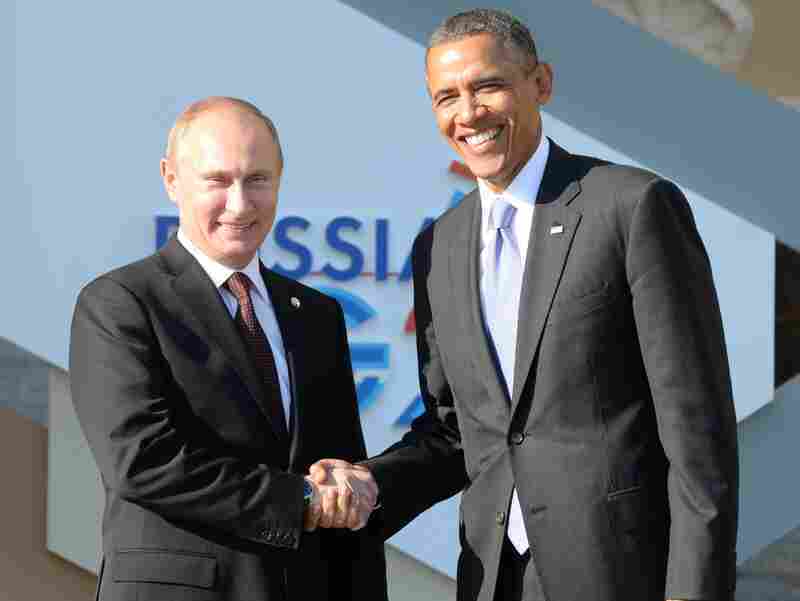 As news outlets continued to report about their "frosty" relations, Russian President Vladimir Putin welcomed President Obama to St. Petersburg on Thursday. Here are four snapshots. Much is being made about the symbolism of the seating at the G-20 summit of world leaders, which begins Thursday in St. Petersburg, Russia, and what it supposedly says about U.S.-Russian relations. "In terms of table placement at least, the Russians are trying to avoid a fight. When world leaders file into St Petersburg's imperial Constantine Palace on Thursday, with the nightmare of Syria and a wider Middle Eastern war on their minds, presidents Vladimir Putin and Barack Obama will be distant from one another literally, as well as politically. "The seating order, which would have had the Russian and U.S. leaders separated only by the Saudi king, has been reshuffled to put five leaders, including David Cameron, between the two key adversaries over Syria and much else." Radio Free Europe/Radio Liberty (in a story posted by Voice of America) notes that "it's often the quiet moves that tell you about the real atmosphere of relations between heads of state. 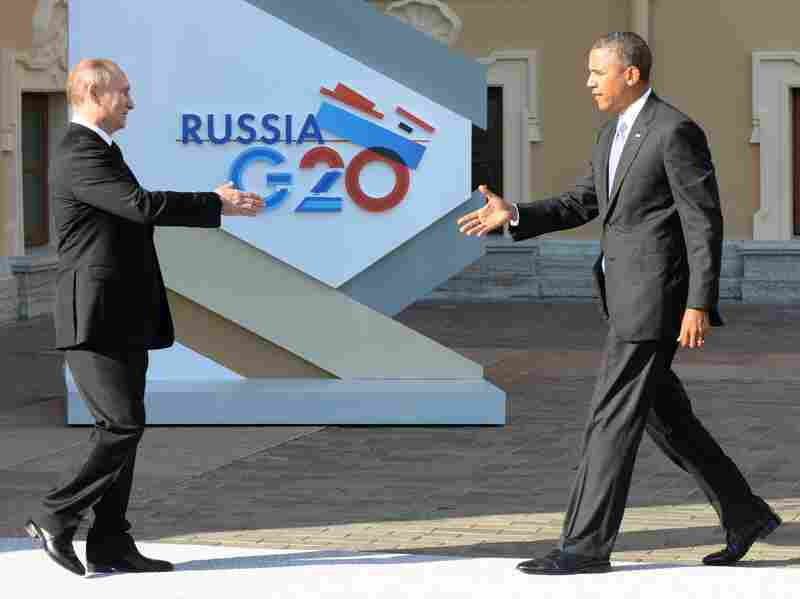 ... Izvestia reported on Sept. 4 that the organizers of the G-20 summit in Saint Petersburg have rewritten the seating plan with the Latin instead of Cyrillic alphabet to ensure that Putin and Obama are not placed near each other." 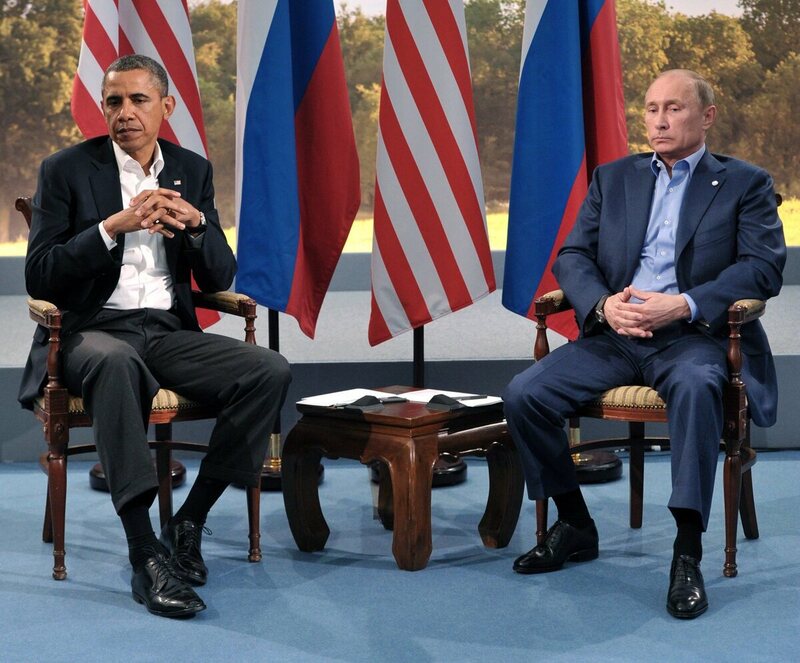 Our friends at Minnesota Public Radio's The Daily Circuit blog have one word for the upcoming Obama-Putin encounter: awkward. According to NPR's Scott Horsley, who is covering Obama's trip to Europe, the two leaders are expected to at least briefly speak to each other at some point: "The two men are expected to chat, either before or after some of the general sessions." But they are not expected to have any lengthy discussions. Even before the U.S.-Russian disagreement over whether to strike Syria, "frosty" was the word that came to mind regarding U.S.-Russian relations. President Obama had already canceled a planned one-on-one summit with Putin, in part because of Russia's decision to give "NSA leaker" Edward Snowden temporary asylum. Obama also recently compared Putin's behavior at an earlier summit of world leaders to that of a "bored kid in the back of the classroom." 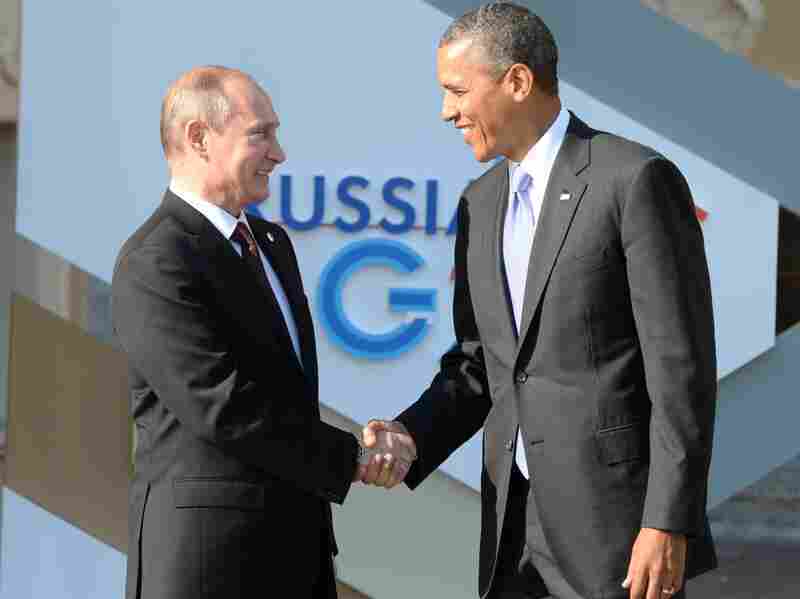 Still, Obama added, "I don't have a bad personal relationship with Putin. ... When we have conversations, they're candid. They're blunt. Oftentimes, they're constructive." One more thing about the seating: Voice of America adds that this "wouldn't be the first time summit seating plans have been politicized. At a NATO Summit in Prague in 2002, NATO officials reportedly rewrote the seating arrangement in French in order to isolate then Ukrainian President Leonid Kuchma at the far end of the table." At June's G-8 Summit in Northern Ireland, Russian President Vladimir Putin and President Obama sat for some awkward photos. In St. Petersburg, they'll be several seats apart during the formal discussions.